Nuclear promoters are desperately hoping to revitalize their failing industry by launching a new generation of hitherto untested “small nuclear reactors” across Canada and the world, to accelerate resource extraction in highly vulnerable northern regions of Canada, to power hundreds of isolated northern communities, including indigenous communities, and to salvage the nuclear industry. For this they need government funds and federal commitment. Meanwhile we have learned that the CNSC has been trying to “rig the game” by getting the Canadian Government to EXCLUDE most of these new reactors from the requirement of having a FULL PANEL Environmental Assessment Review. This has been done by CNSC lobbying government officials behind closed doors without any public process, debate, oversight or discussion. Most of us in the safe energy / renewable energy movement, who are fighting to have a more responsible approach to the long-term management of radioactive waste — including not producing more of this stuff — believe that now is the time to speak up loud and clear in opposition to these dangerous and misguided initiatives. 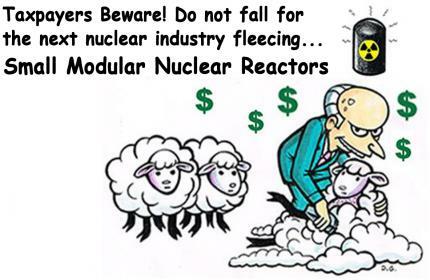 There should be NO federal money (tax dollars) spent on the subsidization of new nuclear reactors, there should be WIDE-RANGING PUBLIC HEARINGS on the long-term management of radioactive waste, and there should be a requirement for a FULL PANEL Environmental Review for any new nuclear reactor project in Canada. In addition, First Nations should be fully consulted regarding each and every one of these initiatives. CNL is the same consortium of multinational corporations that is planning the MEGADUMP beside the Ottawa River, and the GROUTING AND ABANDONMENT of two shut-down nuclear reactors (the NPD reactor on the Ottawa River and the WR-1 reactor on the Winnipeg River). CNL has also been working hard behind closed doors to get the Canadian Ministry of Natural Resources (NRCan) and the CNSC completely on board to finance (pay for) and approve (licence) the building of prototype SMNRs (Small Modular Nuclear Reactors) in Canada, at the two federal sites: Chalk River (ON) and Whiteshell (MB). In early November, at the same time that the Anishinabek Lands and Resources Forum was taking place in North Bay (where Dr. Ole Hendrickson and I gave workshops on radioactive waste storage and transport issues), NRCan was releasing its “Roadmap” for SMNRs in Canada (we always call them SMNRs; they like to leave out the “N” because they know that no one likes “nuclear” anymore).